Garment racking is specifically designed to offer high density storage of clothing in retail stockrooms, warehouses and distribution centres. 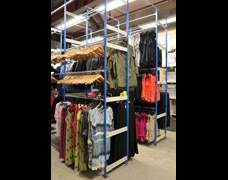 Clothes are usually hung from rails built upon a racking framework or flat-packed or folded in piles on industrial shelving, both of these methods have their advantages but the best solutions combine the two by using a modular racking system. 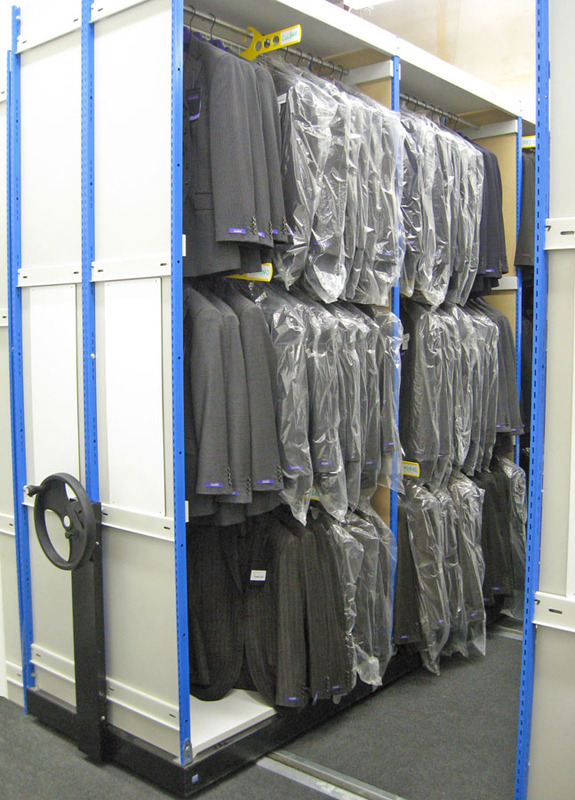 EZR's Trimline racking provides the perfect solution for practical garment storage. 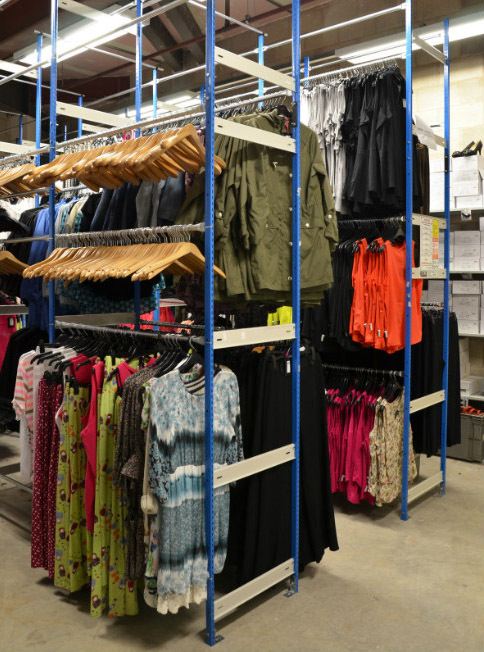 A selection of rails are available to provide hanging racking sections to suit anything from lightweight T-shirts and lingerie to longer, heavier clothing such as dresses or jackets. Each hanging rail bay can also include any number of flat shelves that can be used for storing more garments, accessories and stockroom supplies. 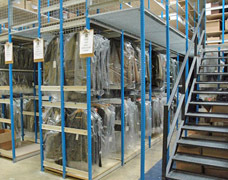 The images here show a number of clothing retailers using EZR garment racking in an outboard configuration, this is the most economical means of storing this type of product with items hanging into the aisle between the racking. Inboard hanging solutions conceal the garments within the racking and provide a useful alternative when the majority of stock is flat packed and only a few hanging rails are required or when there is limited aisle space. Garment rails are easily adjustable at intervals of 25mm providing flexibility to cope with variations in stock sizes and seasonal changes. 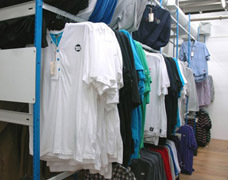 Garment racking is usually supplied three tiers high using 3m high racking. 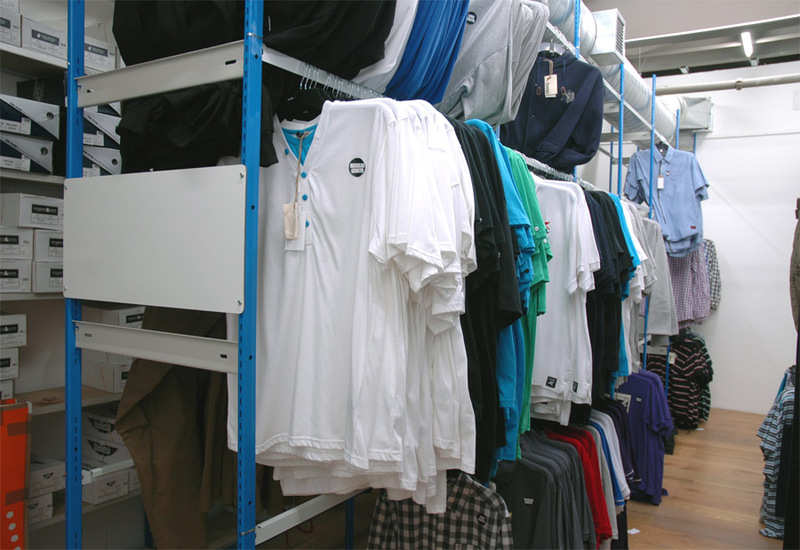 Between 20 and 100 units can be stored per linear metre of racking depending on the type of clothes being stored. 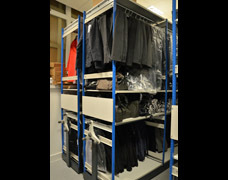 Bespoke commercial garment rack systems can be designed to fit around existing structures to make the most of all available space, multi-level racking systems can also be built to provide a 2nd or 3rd storage level without the substantial costs and planning permissions of a full mezzanine floor. The EZR Trimline shelving system can easily incorporate sections for different types of clothing storage. This creates hybrid hanging and shelving systems that can provide can easily cope with seasonal stock variations. 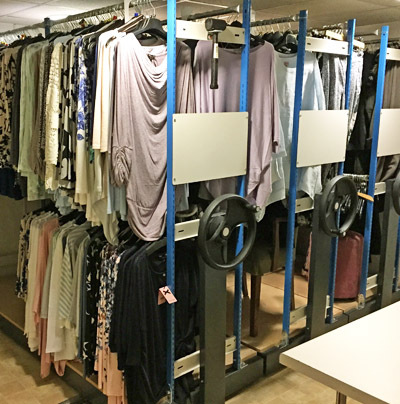 Our design team are not afraid to think outside of the box to accomplish the best possible clothes storage systems and garment racking solutions. Whether you need inboard, outboard or combination units, we can provide the perfect system for your needs. 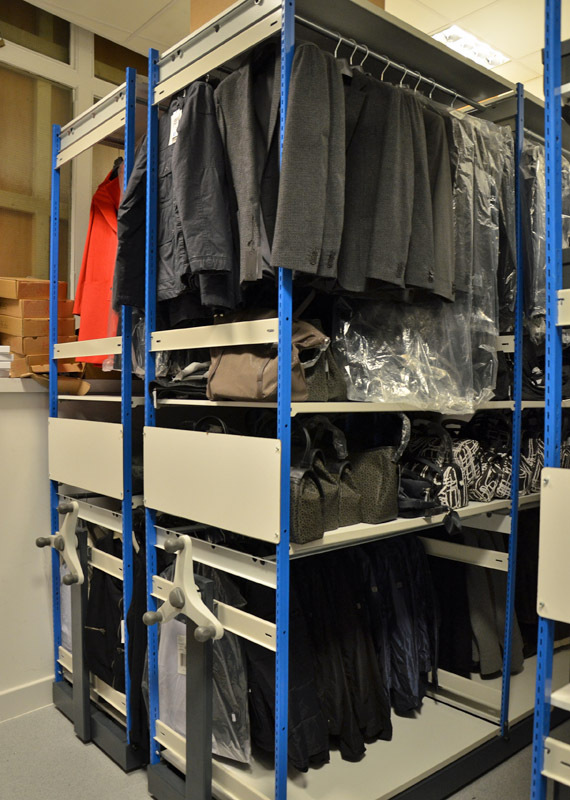 To provide more storage capacity in a stockroom, a high density mobile garment racking solution will increases overall capacity whilst still allowing easy and frequent access. 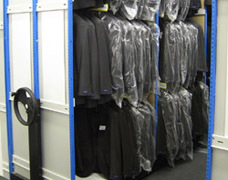 Our Trimline garment racking bays are mounted onto wheeled bases that glide across special floor mounted tracks. These rolling racks feature inboard hanging rails and can be built in a variety of heights to make the most of all of the available space. Thanks to the modular design of the Trimline shelving system, the garment rails can be set at different height intervals to suit the clothing. Flat shelf levels can also be added for storing smaller items and folded clothes within the same unit - This creates a truly flexible retail storage solution that can cope with changing fashion trends and seasonal stock fluctuations. 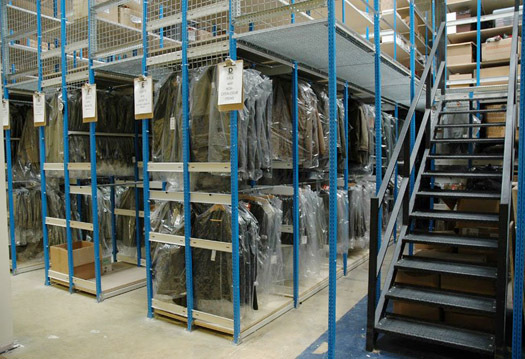 We specialise in bespoke stockroom storage systems and we supply many of the UK's leading fashion brands, high street retailers and independent stores with high quality stockroom racking solutions. Every stockroom is unique and we pride ourselves in supplying the very best products for back of house retail environments. From the smallest corner of a stockroom to the vast expanse of a garment distribution centre we can supply the right clothing storage systems at the right price. 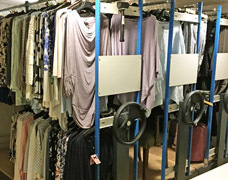 Contact us today to find out how our static and/or mobile hanging storage solutions can benefit your clothing business and to obtain a free quotation.